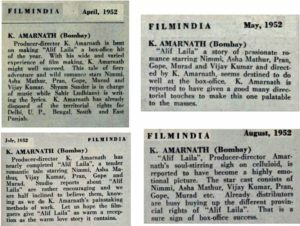 A Magical/Fantasy/Arabian Nights – Aladdin style movie, “Alif Laila” was the first movie produced by K. Amarnath under his own banner – “K.Amarnath Productions”. 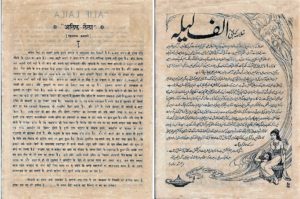 The story of Aladdin and his magic lamp is one of the most famous of all the “One Thousand and One Arabian Nights” stories. 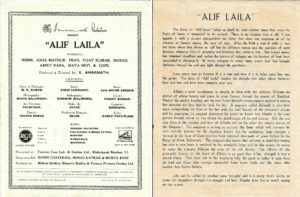 It has been re-told in many variations and in this movie, the story involves the hero, heroine and the “Genie in the Lamp” in an emotional love triangle interspersed with many comic interludes. 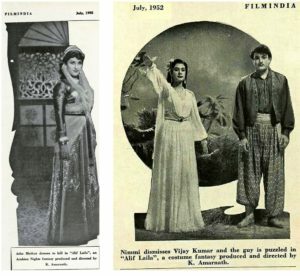 One of the best performances given by Nimmi, comedian Gope and character actors Pran & Murad. 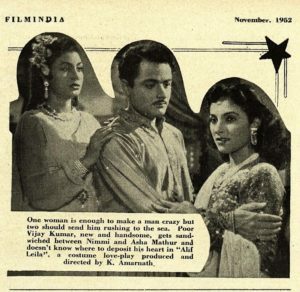 Nimmi was initially offered the role of the Princess – but after reading the script she preferred the role of the “Genie in the Lamp”. 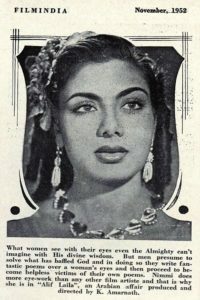 She loved the emotional as well as humorous characterization of the genie so much that she requested producer K.Amarnath if she could do that role instead. 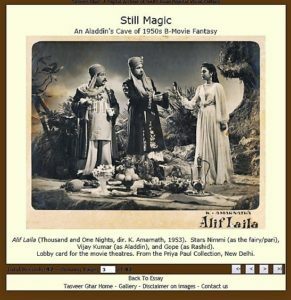 “Her wish” was granted – no pun intended!! 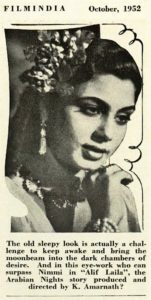 Though she acted in a secondary role, she was given first billing in the credits. 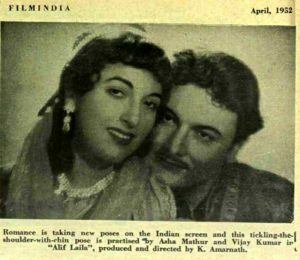 In 2008, when I met Nimmi at Madhubala’s Stamp Inauguration in Mumbai, even 55 years after “Alif-Laila” had first been released in 1953, she still remembered how much she had desired to play the role of a “pari”. 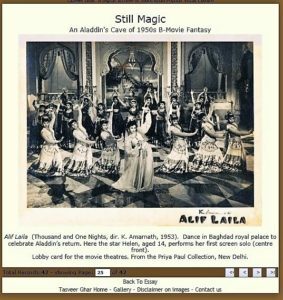 It can be seen from her portrayal of the genie that she really enjoyed enacting that role, since her performance was absolutely fantastic. 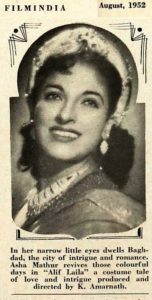 Helen got her first break as a lead dancer in this movie in the song “Raatein Pyar Ki Beet Jayengi”. 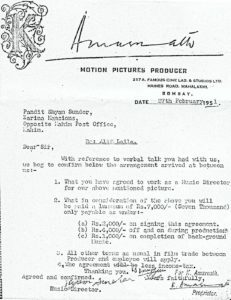 This was also hero Vijay Kumar’s first movie. 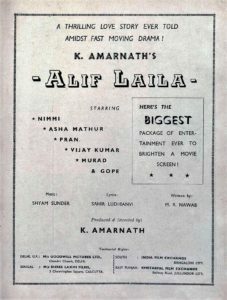 Unfortunately, Alif Laila was the last movie of music director Shyam Sundar. 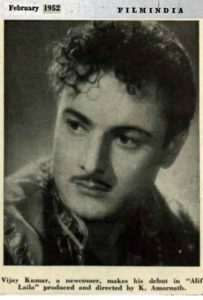 Due to his death, Madan Mohan completed the composition of some of the songs for this movie.